As the days get longer and temperatures begin to climb, off go the jackets and sweaters and on go the shorts and dresses. After the long, cold winter, Spring is here and it’s time to spruce up our skin care routine and head out to embrace the sunshine. The cold months can leave behind a residue of dead skin cells, leftover product, and accumulated toxins. Use a gentle, natural ingredient-based cleanser like YOUTH® Luminous Gel Oil Cleanser that’s free of artificial fragrances, harmful surfactants/detergents, and harsh chemicals. 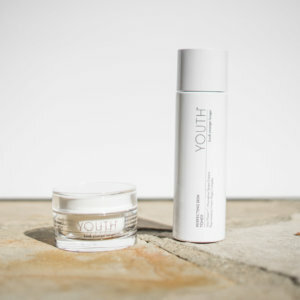 Follow your cleanser with a toner, such as YOUTH® Perfecting Skin Toner, to deep clean your pores, hydrate, exfoliate, nourish, and remove any last traces of grime. After some very drying weather, we need to rebuild our skin’s protective barrier and replenish the moisture that was lost. As humidity increases in warmer months, use lighter moisturizers to keep your skin healthy, hydrated, and vibrant. You may want to try one of YOUTH’s new Power Duos. With the Hydrate + Nourish Duo, you start with Perfecting Skin Toner to exfoliate and drench your skin with deep, long-lasting hydration. This unique toner features a patented blend of vitamins, polyphenols, and botanicals to re-energize skin cells. After the toner, you just layer on Advanced Renewal Night Cream to smooth and soften your skin. The sun is out now, and all we want to do is head out after months spent indoors. If the sun is calling your name, just remember, the most important thing is to make sure you use a broad spectrum sunscreen for protection against both UVA and UVB rays, even if it’s cloudy out. To make sure that your skin stays protected all day long, reapply your SPF lotion or moisturizer every 2 hours during exposure to sun. Spring calls for a lightweight makeup solution. You can opt for a lightweight BB cream instead of heavy foundation to achieve a flawless look. YOUTH Activating BB Cream is a tinted 5-in-1 product to even, correct, hydrate, nourish, and protect skin. And it provides SPF 30 protection. A BB Cream can be a fantastic time-saver as it provides multiple benefits in one simple step (We love products that are multi-functional!). This is also a good time to spring clean and discard old skin care products that are past their expiration date. You may want to toss out old, dirty makeup sponges and brushes or products that have changed consistency, color, or smell. Also, commit to at least a monthly brush cleaning (How about the first Saturday of every month?). To wash your brushes, use a liquid hand soap or baby shampoo and rinse with lukewarm water. Gently squeeze out the water, reshape, and let brushes dry completely before using them again. Last but not least, don’t forget your overall health. Nothing looks better on your skin than great health. Eat as many veggies as you can; drink lots of water; and avoid processed foods, trans fats, and too much sugar. And remember to exercise regularly—your skin will love you for it!